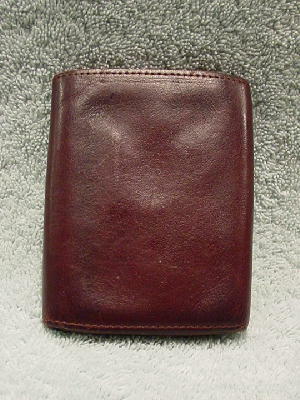 This vintage burgundy-brown wallet is genuine leather. 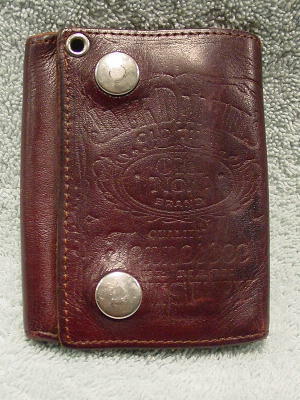 It has a 2 silver-tone (with some tarnishing) snap front closure. 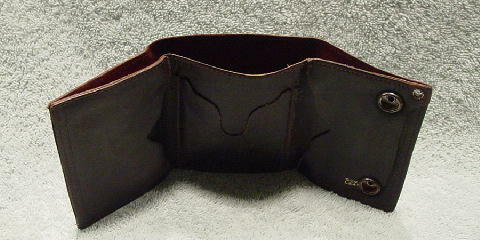 It has a trifold opening with a compartment on each side and a full open back section to hold dollar bills. There is a silver-tone rivet on the upper left corner. The front has some scuff marks and scratches and the back has some scratches. The interior has indentations and some scuff marks. On the front is etched Jack Daniels Old Time Old No. 7 Brand Quality Tennessee Sour Mash Whiskey.